Mark Davison (trombone/euphonium/tuba) is a graduate of Sun Prairie High School. 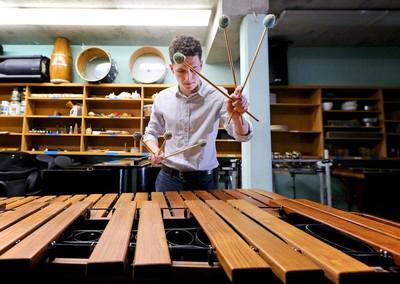 He earned a Bachelor of Music Education degree from UW-LaCrosse. 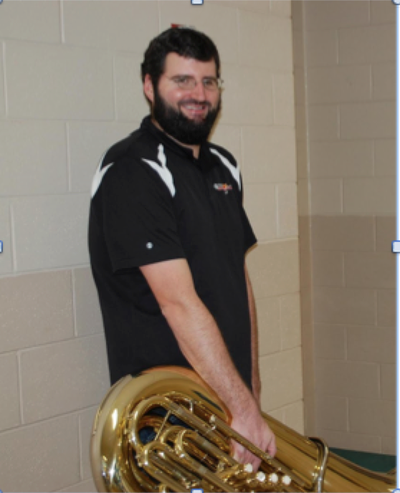 As a tubist, he has performed with a number of different ensembles including the LaCrosse Symphony Orchestra. Mr. Davison currently teaches private trombone, euphonium and tuba lessons. He is also one of the directors for The Sound of Sun Prairie Marching Band. He is a highly sought after clinician and educator. 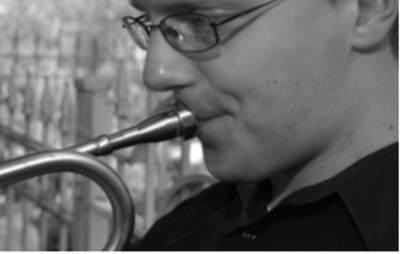 Paul Dietrich (trumpet) is a Midwestern-based trumpet player, composer, arranger, and educator. He is the leader of the Paul Dietrich Quintet, a jazz group that draws on influences from modern and classic jazz, Western classical music, folk, progressive rock and other diverse genres. Their first album, We Always Get There, was released in 2014 to critical acclaim on Chicago's Blujazz record label. Equally comfortable as a performer and composer, Paul earned his Bachelor's degree in Trumpet with an emphasis in Jazz from Lawrence University in 2010 and a Master's of Music in Jazz Studies from DePaul University in 2012. He is an active performer throughout Chicago and Wisconsin, and is an active member of several of Madison's best jazz groups. Jessica Jensen (trumpet) began playing trumpet at the age of 10 in her hometown of Hortonville, Wisconsin. She went on to earn her Bachelor's degree from the nearby Lawrence University in Appleton under the tutelage of John Daniel. She then completed her Master's and Doctorate in Trumpet Performance from the University of Wisconsin- Madison under the guidance of John Aley. While studying at UW-Madison, she was a member of the UW's faculty-ensemble-in-residence, the Wisconsin Brass Quintet. Currently, Jessica is an active educator, with a private studio of over forty Madison-area trumpet players, and she regularly conducts masterclasses at regional schools and universities. As a performer, she is a staple of the area's music scene, appearing regularly with orchestras in southern Wisconsin and northeast Iowa. 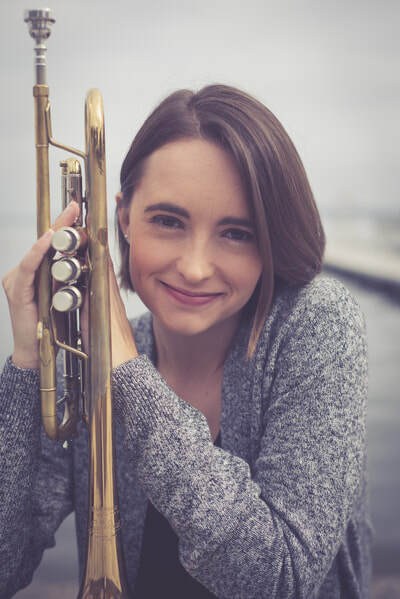 An avid chamber musician, she is a member of the University of Wisconsin-Whitewater's faculty brass quintet and the Madison-based Lake Edge Brass Quintet in addition to her work with the Chicago-based V3NTO Brass Trio. 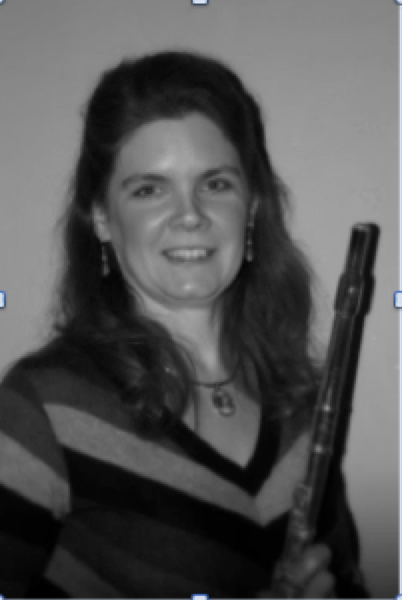 She has also appeared recently as a featured soloist with the Middleton Community Orchestra and the Capital City Band. Outside of her musical activities, Jessica enjoys spending time with her fellow trumpet-playing husband, Paul, their overly enthusiastic golden retriever, and her mischievous, but incredibly intelligent pet rats. Kai-Ju Ho (clarinet) Kai-Ju Ho is a versatile clarinetist performing internationally in recitals, concerti, chamber music, and orchestras throughout the United States and abroad. Ms. Ho was the First Prize winner of the International Clarinet Association’s Young Artists Competition in 2012. Her playing was heralded as “very musical, with smooth technique and clean playing” in The Clarinet Journal’s 2012 performance review. 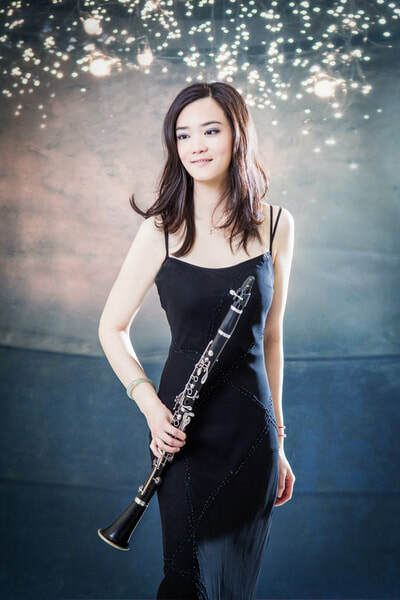 Kai-Ju is originally from Taipei, Taiwan, and she is now currently finishing a Doctorate of Musical Arts in clarinet performance at University of Wisconsin-Madison School of Music where she studies with Professor Linda Bartley. She is also a distinguished recipient of Paul Collins graduate fellowship, the highest award at the University of Wisconsin School of Music dedicated towards exceptional performance and leadership within the university. Kai-Ju has received numerous awards, including First Prize in the 2015 Irving Shain competition, winner of the 2013-2014 University of Wisconsin-Madison School of Music concerto competition, winner of the 2013 Sidney Wright Award. As an active orchestral musician, her orchestral appearances include performances with Cleveland Symphony Orchestra, Blossom Music Festival Orchestra, Round Top Music Festival Orchestra, Chimei Philharmonic Orchestra, and Taipei Philharmonic Youth Orchestra. Edgewood College. Aaron holds a B.M. in Percussion Performance from UW-Madison. Victoria Rockman (flute) studied Flute Performance at the University of Wisconsin-Oshkosh with Dr. James Grine. She is a former member of the Oshkosh Symphony Orchestra. Victoria performs in many different venues, including a Messiah orchestra, SPCT pit orchestras, as a wedding musician and various other group and solo opportunities. She has also performed a solo with the Martin Luther King, Jr. Celebration Choir in the State Capital for the Martin Luther King, Jr. celebration. Victoria maintains a flute studio in Sun Prairie with students from as far away as Waterloo, Wisconsin Dells, and Hortonville, WI. Many of her students participate in groups such as the Oshkosh Symphony Orchestra, Wisconsin Youth Symphony Orchestras, Winds of Wisconsin, Shell Lake Honors Camp, WSMA State Honors Band and Orchestra, Interlochen and other honors performing opportunities. Her students consistently receive top honors in solo and state competitions, and many of them have gone on to pursue degrees in music. In addition to individual lessons, Victoria’s students are educated in flute choir experience. Her studio currently has three flute choirs, and she has recently been directing a flute choir at Sun Prairie High School. Currently, Victoria is residing in Sun Prairie, WI, with her husband, Jim, and their four children, Robert, Joseph, Alexsandra, and Anastasia. 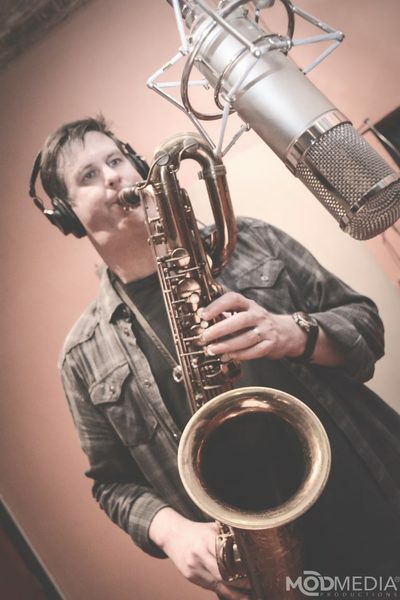 Anders Svanoe (saxophone) got his start in music taking piano lessons, singing in church choirs and playing saxophone and piano in the public school bands. In 1991 Anders graduated from Luther College and in 1994 he completed his Masters Degree from the University of Wisconsin-Madison. In the mid 1990s Anders studied with Frank Morgan while Frank lived in Milwaukee, Wisconsin. “Frank taught me everything about the saxophone, especially the importance of sound.” Another key component to Anders’ post-graduate education was his meetings with multi-instrumentalist and composer Roscoe Mitchell. Since 2001 Anders has played and recorded with Roscoe in various contexts ranging from duos to large ensembles.As a member of the Transatlantic Art Ensemble, The Roscoe Mitchell Big Band, and a guest with Roscoe Mitchell’s Note Factory, Anders has performed with a “who’s-who” in the jazz/contemporary improvised music scene: Evan Parker, Corey Wilkes, Craig Taborn, Philipp Wachsmann, John Rangecroft, Neil Metcalfe, Nils Bultmann, Marcio Mattos, Jaribu Shahid, Barry Guy, Tani Tabbal, Paul Lytton, Vijay Iyer, Ari Brown, Mwata Bowden, Spencer Barefield, Gerald Cleaver and many others. Anders has also performed with The Cab Calloway Orchestra, Greg Abate, Jon Irabagon and the award winning Tony Castañeda Latin Jazz Sextet. In 2007 The Institute of Jazz Studies at Rutgers University published Anders’ book on bebop saxophonist, Sonny Red, in its “Annual Review of Jazz Studies 13.” “Bluesville: The Journey of Sonny Red” was a 10 year project focusing on the virtually unknown, but very unique, saxophonist from Detroit. The book includes transcriptions, a discography, and an oral history which includes interviews from: Curtis Fuller, Kiane Zawadi, Tommy Flanagan, Frank Foster, Charles McPherson, Louis Hayes, Jimmy Heath, Talibe Kibwe, Cedar Walton, Yusef Lateef, many more musicians and family members. Anders is currently teaching saxophone and the Improvisation Ensemble at Beloit College. Lessons take place one day per week in the music wing at Patrick Marsh Middle School. Lessons will be on Thursdays for all instruments with spots beginning at 3:00 pm and ending at 5:00 pm. Each lesson is 20 minutes long. To sign-up for lessons, please register on the main Band Lesson Academy page. Once you have completed this Mr. Gleason or the private lesson teacher will contact you to set up a specific lesson time. Lessons are $16 per 20 minute lesson. The tuition fee can be paid by the semester or by the month. You will be invoiced by the semester or month based on your decision. Payments are made via PayPal. Exact amounts for each semester, along with exact dates can be found below. Families are asked to commit to a semester of lessons. No refund can be made for missed lessons. Thirty day written notice is required for withdrawal from program. Without these policies it is impossible to secure quality private teachers for our students.